Two weeks ago I got the privilege of visiting one of Chicago's oldest private social clubs, The University Club of Chicago. Founded in 1887 by a group of university graduates who wanted a place where they could get together, enjoy intellectual pursuits and promote literature and the arts. This led to the need for a university degree to be the core requirement for membership, which continues to be the core requirement today. I started off my visit with a wonderful lunch in the Front Grill, which is just one of several meal options at the University Club. With top chef, Mark Baker, at the helm everything on the menu which includes comfort foods, seasonal offerings and an express lunch for those who want to sit down to a nice meal without keeping an eye on their watch. I decided to have the express lunch. It was really the homemade soup that finished off that decision! The chocolate gelato with the sugar cookie baked in the in house bakery was the cherry on a lovely meal. After lunch we started on the tour, which lets be honest was my absolute favorite and the part I had been looking forward to in the two weeks before my visit. The groundbreaking on the 76 E. Monroe building started in 1907 and the building was completed in 1909. 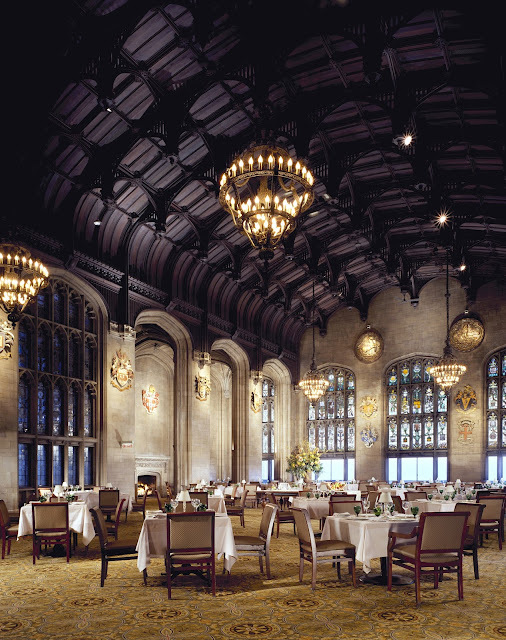 Designed by Martin Roche of Holabird & Roche, known for their groundbreaking Chicago School skyscrapers and projects such as Soldier Field, the University Club of Chicago was a groundbreaking project in it's own right being on of the first, if not the first, Gothic skyscrapers built. The piece de resistance of the building, in my opinion, is Cathedral Hall. Modeled after Crosby Hall in London this awe-inspiring room boasts so many artistic attributes with the crown jewels being the stained glass windows. Designed by Frederic Clay Bartlett, a member of the University Club and trustee of the Art Institute, the windows showcase a zodiac sign as well as a general theme for each window, including topics like music, American colleges, the arts, etc. Throughout the years there have been coats of arms donated in representation of various universities. These works of art were created by the last living member of the Heraldic Wood Carvers in Germany and were then authenticated by The College of Heraldry in London. Like many skyscrapers built during this time there are an insane amount of beautiful details and you pair that with the University Club of Chicago's art collection and it's a jaw dropping sight. Membership in the University Club of Chicago includes so many benefits. The two that stand out as my favorite are the wonderful dining venues at a fantastic price (where can you get a multiple course lunch for under $20 in the Loop?) and the 12,000 plus library. There are so many societies that you can be a part of it's hard not to find one that would interest you, from the Beer Society to the Writing Society. Interested in more athletic pursuits? The squash program is nationally ranked and the University Club hosts both professional and amateur events throughout the year. In addition to more organized athletics there are group exercise facilities, cardio machines and weight machines. Plus who could turn away discounted massages. Like many private clubs there are guest rooms that members can take advantage of. With it's perfect Loop location this is the perk that is for someone who is working late and lives in the burbs, wants a fantastic stay-cation weekend by all the best Chicago has to offer or just wants something new for the night. I got a chance to peek into the room and loved all the details I saw! The blueprint canvases of the building were fantastic. Membership is open to anyone and everyone with the main requirements for membership are degree from an accredited college or university and a nomination and two supporting letters from an existing member.. There are two different types of memberships, Non-Resident and Resident, which depending on your mileage from the club will change the fee you pay. For more information on the levels and how it would be specifically for you contact membership@ucco.com. 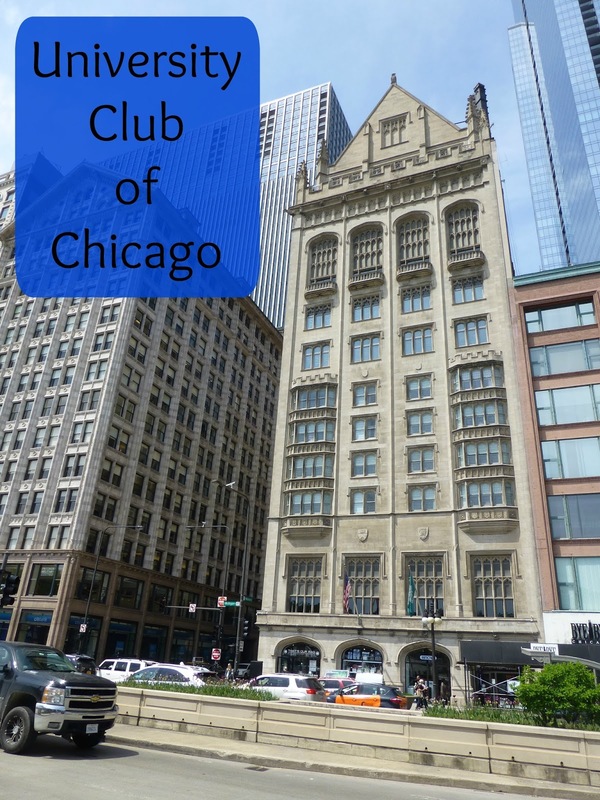 The University Club of Chicago hosts monthly events open to prospective members with their next one coming up next week on June 6. if you are interested and want to learn more about membership contact them at membership@ucco.com. Getting a behind the scenes look at this Chicago institution was wonderful and I'm glad I had the opportunity!